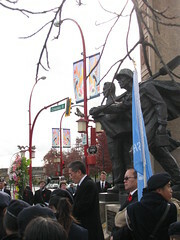 the November 11, 2009 Remembrance Day ceremony in Vancouver Chinatown. With sorrow… we share the news that Grand-Uncle Daniel Lee passed away this morning of January 26th, 2010. He had been in the Burnaby Hospital since Wednesday. His daughter Grace, she said it was quite sudden – his going into the hospital. I had been receiving reports from my mother Betty, as her mother Mabel (Dan's oldest sister at 99 years old) was visiting the hospital each day. Uncle Dan was born the 11th child of 14, the 5th son of seven to jeweler Ernest Lee, and Kate Chan Lee – the 2nd child, and 1st daughter of Rev. Chan Yu Tan. As a young child he spent some time living in Nanaimo with his grandparents Rev. and Mrs. Chan Yu Tan, after the early death of his father. 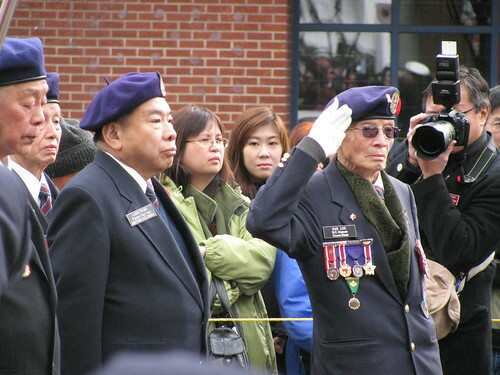 When Dan was 20 years old he tried to enlist in the Canadian Army, but was turned away because at that time they did not allow any Chinese Canadians. Instead, he went to aircraft mechanics school in Toronto and graduated two years later. By 1942, Chinese were allowed into the Army due to pressure from Great Britain. 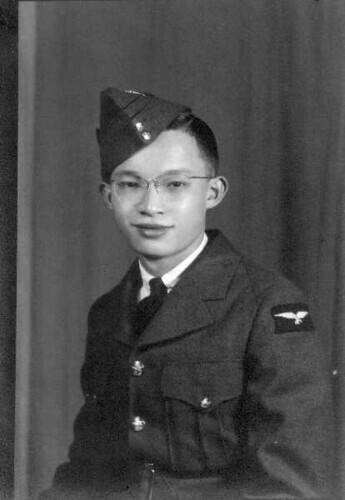 Dan Lee was one of the the first Chinese-Canadians accepted into the Canadian Air Force. Soon, he was joined in England, by his brothers Howard and Leonard, plus cousin Victor Wong, who were enroute to the Pacific Theatre to serve with the Army special forces. head tax and exclusion act. The Chinese head tax redress movement took on a larger significance after MP Margaret Mitchell brought the issue up in Parliament in 1984, and also when Prime Minister Mulroney apologized to Japanese Canadians in 1988 for the the government's interning of them during WW2. Congress of Chinese Canadians(NCCC) and a national conference was held. After many years, an apology was finally made in Canadian Parliament by Prime Minister Harper in 2006. 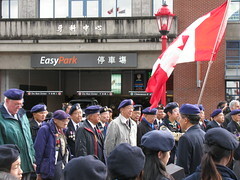 In 1998, the Chinese Canadian Military Museum was founded. Dan Lee's air force uniform was one of the first displays. In 1999, we held the first Rev. Chan Legacy Family Reunion. Uncle Dan was a consultant for the committee. At the reunion, it was Dan Lee who gave the Elder Address, as he talked about his grandfather Rev. Chan Yu Tan. In 2002, the Rev. Chan Yu Tan family was featured in the Chinese Cultural Centre Museum exhibit “Three Canadian Chinese Pioneer Families” – pictures of Uncle Dan and the contributions of himself and his brothers and cousin were included. 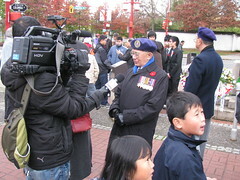 In 2007, Dan Lee is one of the lead stories in the film documentary Heroes Remember, produced by the Chinese Canadian Military Museum. received the Award for Service. And through all these years, Uncle Dan would sell poppies in downtown Vancouver for Remembrance Day, and help organize the Poppy Drive every November. He was one of the best sellers. 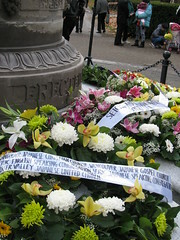 He was also one of the organizers of the Victory Square Cenotaph Remembrance Day ceremonies. 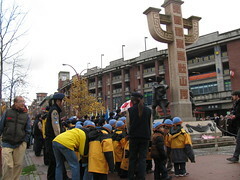 In 2004, Remembrance Day ceremonies began at the Canadian Chinese Pioneer Monument in Chinatown. 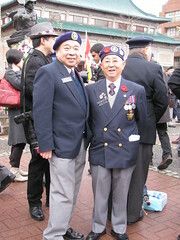 The veterans of Unit 280 would attend both Victory Square and Chinatown ceremonies, even if it was raining and cold. The contributions that Dan Lee made, will last and be remembered, while he will be missed. We offer support and love to Uncle Dan, his wife Irene, and their children Vincent and Grace. with fellow veterans of Pacific Unit 280 + Ujjal Dosanjh MP. pioneer, Grandfather Chan Yu Tan. This entry was posted in Canadian Identity, Canadian Identity & Heritage, Chinatown Vancouver, Chinese Canadian History, Chinese Head Tax issues + Gim Wong's Ride for Redress, Main Page, Remembrance Dat, Rev. 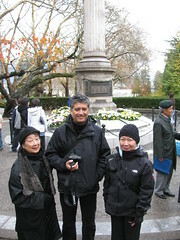 Chan Legacy Project, Vancouver Heritage and History on January 28, 2010 by Todd. 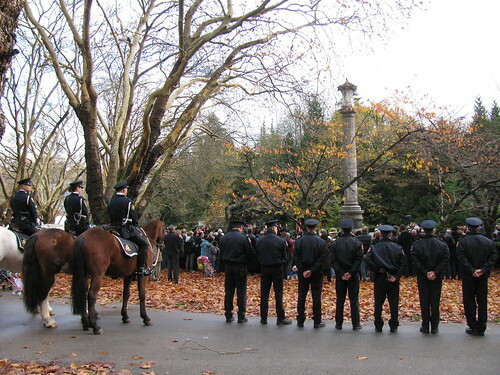 Mounted police, and beat policemen and firemen attend the Remembrance Day ceremonies at the Japanese Canadian War Memorial in Stanley Park. – photos Todd Wong. I really like this photo of two people walking to the memorial ceremonies. After WW2, the Japanese communities in both Canada and USA became the most inter-racially married. This little girl definitely had Asian features but with light coloured hair. Many of my friends of Japanese ancestry also have mixed race heritage, or their children or grandchildren do. 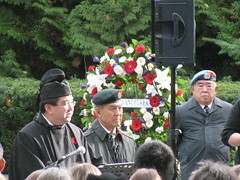 The ceremonies were led by a Church minister and Major (retired) Roy Kawamoto. 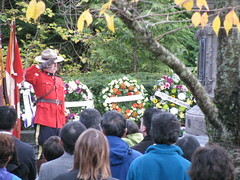 Vancouver City Councilor Geoff Meggs laid the wreath for the City of Vancouver. 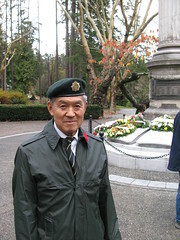 Major (Ret) Kawamoto told me that during WW2, had been arrested for defying the order of evacuation for Japanese Canadians. He was 12 years old at the time, put in jail, then sent to Greenwood internment camp. 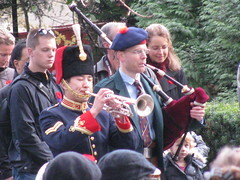 Japanese-Canadian bugle player and Scottish-Canadian bagpiper. Maybe their ancestors fought against each other in WW2, or as allies or comrades with each other in WW1. No, they didn't play at the same time. 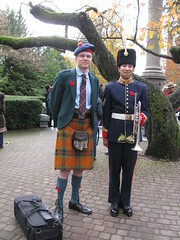 This entry was posted in Bagpipes, Kilts - wearing kilts, Main Page, Multicultural events, Remembrance Dat, Vancouver Heritage and History on November 12, 2009 by Todd. Uncle Daniel Lee salutes, as photographer Patrick Tam takes pictures. Larry Wong stands to Lee's right. 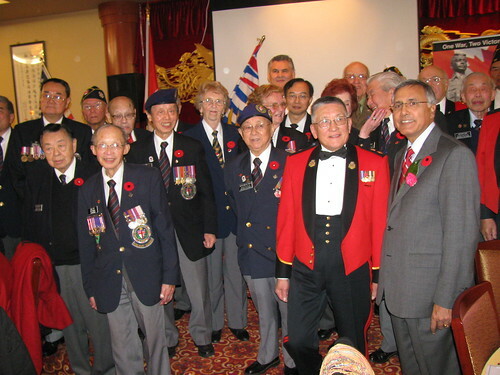 Chinese Canadian veterans stand during singing of O Canada. The Chinese Benevolent Association organized the Remembrance Day ceremonies this year in Chinatown. President Mike Jang officiated. 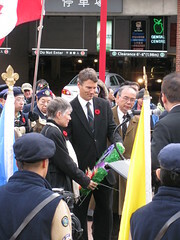 Vancouver mayor Gregor Robertson and city councilors Ellen Woodsworth and George Chow lay the wreath from City of Vancouver. 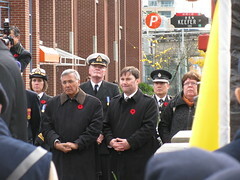 Members of Parliament Ujal Dosanjh, Don Davies and Libby Davies stand in front of the representatives from HMCS Discovery. Frank Wong, who stormed the Normandy Beaches on D-Day speaks to Chinese language TV News, while his brother Bing Wong's grandchildren are in the foreground, as I talk with their dad and grandfather. Larry Wong and Howard Chan. Howard is a WW2 veteran. Larry is curator of the Chinese Canadian Military Museum. 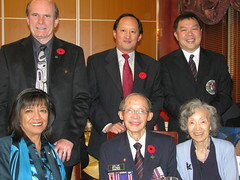 This entry was posted in Asian Canadian Cultural Events, Chinatown Vancouver, Chinese Canadian History, Main Page, Multicultural events, Remembrance Dat, Rev. 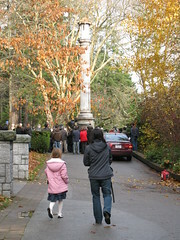 Chan Legacy Project, Vancouver Area Adventures, Vancouver Heritage and History on November 12, 2009 by Todd.